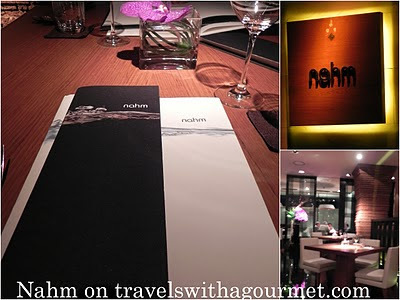 Chef David Thompson’s Thai restaurant Nahm first opened several years ago in London at The Halkin hotel to rave reviews and a foodie following. Recently, he opened a second outpost in Bangkok at another COMO hotel, The Metropolitan. 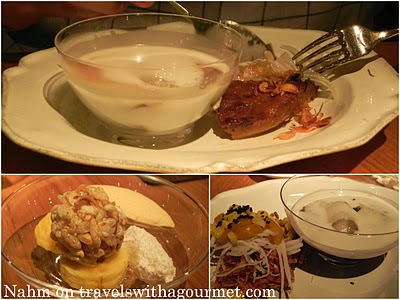 Most Thais were skeptical that a farang (foreigner in Thai) would be able to make Thai street food in a formal setting but since opening, the controversy has turned to awe as picky diners and foodies arrive doubtful and leave pleasantly surprised with the refined yet authentic Thai cuisine served here. I have to say that I had read many rave reviews and studied other blogger’s meals at Nahm and had booked a table via email a month in advance to be sure that I wouldn’t leave Bangkok without having dinner there. We arrived for our 7:30 reservation slightly early and were led to a front room table for two – simple unadorned wood tables sans tablecloth with just one perfect orchid in a square glass vase making the setting subdued but not formal. The a la carte menu is divided into different sections: canape, salad, soup, relish, curry and finally stir-fried steamed and grilled. There is also the option to have the set menu (1500 THB) which is composed of several dishes – canapes, a dish from each section of the menu and dessert. The portions are adjusted depending on the number of people ordering the set menu and is served family-style. 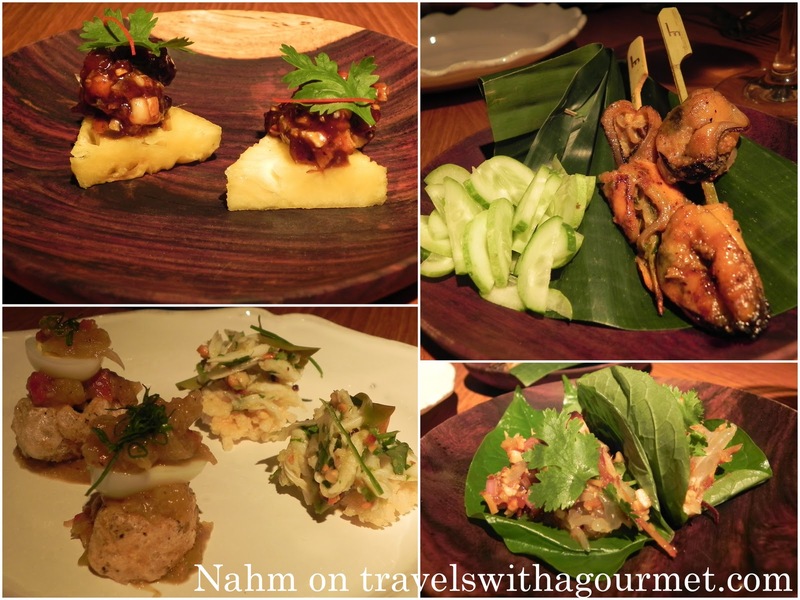 As there were several dishes we wanted to try but were reluctant to order from each section, it made much more sense for us to both order the set menu and have a real taste of what Nahm had to offer. Along with our menus, we ordered a glass each of white wine – Riesling for me and Sancerre for A. Our wines were served along with the amuse-bouche – a tiny triangle of pineapple topped with a sweet palm sugar and nut ball which was a sweet-sour burst of sticky flavor in the mouth. The canapes came next and were served all together: southern-style grilled mussels with a cooling cucumber salad along with three cold canapes – pomelo and grilled prawns with toasted coconut, peanuts, palm sugar on betel leaves, shredded blue swimmer crab on rice cakes and a chili relish with pork scratching on quail eggs. They were delicious and bite-sized, except for the skewered mussel, so all we had to do was pop them in our mouths. The freshness of the grilled mussels were perfectly hot-sweet-smoky and the tiny version of the traditional pomelo and prawn salad on betel leaves were a sour-sweet-crisp version. Thai cuisine is characterized by the mix of sweet, sour, salty and spicy flavors and in most, if not all, dishes these flavors come up. Thai-style dining is always done family-style so the next few dishes, on from each section of the menu, arrived all at the same time and were set down on the table for A and I to share. There was the salad of lemongrass, prawns, crispy squid and pork and toasted coconut, the clear soup of roast duck with Thai basil and young coconut, the relish of shrimp paste and catfish simmered in coconut cream which came with two separate side dishes of deep-fried soft shell crab and fresh vegetables, the green curry of salted beef ribs with Thai eggplants and basil and finally the stir-fried bean curd with prawns and pork. We were served steamed jasmine rice to go along with the food which we dug into with gusto. 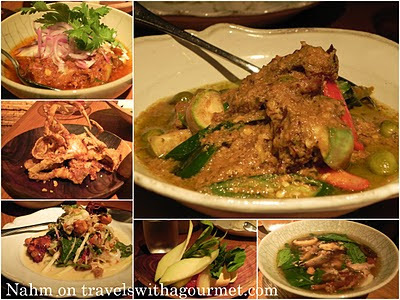 The trick to eating Thai food is to have a little bit of each dish and then alternate between the flavors, from very spicy (the relish) to cooling (the salad), or from hot and creamy (the curry) to hot and sweet (the soup). The green curry which we thought would be very spicy was not and the relish which we thought would be mild, was extremely spicy. The stir-fried bean curd and prawns was delicious and helped to alleviate the spiciness of the other dishes. Halfway through our meal when our mouths were on fire from the relish, we had to ask the server to bring us something to cool our tongues down which he promptly did – a few slices of rose apple and dollops of palm sugar. Apparently the way to get rid of the spicy flavor is to eat something sweet so we took alternating bites of the crisp rose apple, similar in crunch to a pear or radish, along with a pinch of palm sugar and it worked fine but neither of us touched the relish again for the rest of the meal, although we did polish off the soft-shell crab. By the time dessert had to be chosen, we were both slightly sweaty from the chili and ready for something sweet. I had the black sticky rice with slices of young coconut in coconut cream and was served with an interesting jumble of corn kernels, black sesame seeds, shredded coconut on a crispy sticky cake and A had the sapodilla, a tropical fruit that looks like a sweet potato, with coconut cream and a yellow bean and cashew nut pudding. Along with my lemon tang infusion and A‘s espresso, we were also each served a tiny glass bowl with four Thai-style petits-fours – a crispy rice ball, a soft and gooey coconut bite, a slice of banana and a crumbly oblong-shaped cookie. Our meal at Nahm was extraordinarily delicious and beautifully-presented – a taste of authentic Thai food in elegant surroundings and at 1500 Thai Baht (around US$50) for the set menu, it’s not cheap but it was worth it and I would gladly go back to Bangkok just to be able to eat my way through Nahm’s menu. Open daily for dinner only. Reservations recommended.